Courtship in Birds; Same Old Song and Dance? “Everyone likes birds,” Sir David Attenborough. The birds-of-paradise, (Paradisaeidae), are pretty close to our shores. These colorful little birds (especially the males with their long plumes) are actually found in rainforests in surrounding islands of Indonesia and New Guinea. Perhaps, even closer to home, is how close their mating behavior is to the courtship behavior in human beings. The Birds-of-Paradise have developed a social mating system based on arenas or leks. Essentially, this is a stage that is cleared for the male to do his song and dance; a highly elaborate courtship display that features the magnificent plumage. The star of the video above is actually of the species of the Paradisaeidae, the Wilson’s Bird of Paradise (Cincinnurus respublica). He starts by actually clearing the arena, of twigs and leaves. This allows his magnificent color coat of feathers and unusually long plumes to be more visible to the potential female mate. At one point of time, it even displays its distinctive breast shield. The video below features another, not so magnificently colored male species of the Paradisaeidae, using a similar stage or arena, for courtship behavior. Similarly after clearing away leaves and twigs, the stage is set for the male to put on his phenomenal dance show. Taking the ritual very seriously, he evens warms up before beginnings his elaborate display as this may last up to a few hours! Studies have also shown that there is a strong correlation between achieving female preference if they were more conspicuous as possibly indicates a higher survival and fecundity for the female. Interestingly, these elaborate displays seems to be learned behavior as the younger males stay on the fringes of the arena to practice clumsily before the star of the show takes over in the centre stage. Irestedt, M., Jonsson, K. A., Fjeldsa, J., Christidis, L., & Ericson, P. G. (2009). An unexpectedly long history of sexual selection in birds-of-paradise. BMC Evolutionary Biology . Kirkpatrick, M., & Ryan, M. J. (1991). The evolution of mating preferences and the paradox of the lek. Nature , 33-38. Animals make use of social indicators to initiate play, and to delineate a space for play behaviour that is not to be taken too seriously by playmates. Taking an example from canine social behaviour as observed in the video above, the play bow is used as an indicator of the desire of an individual to play. It gives the impression of being ritualized and according to Dr Marc Bekoff, the meaning of the play bow is essentially this: “Whatever I did, or am about to do, I’m just and am still playing!” In such a context, social codes of conduct are learnt in a relatively safe environment, as transgressions are generally not punished in the course of social play. Individuals learn what is permitted, what is not and what constitutes fair play, and how to behave fairly in a group setting. Dr Bekoff suggests some connections between social play behaviour and animal morality, by studying the codes of social conduct and linking it to the evolution of morality. In the video, the ‘T’ position is considered an indication of inappropriate play behaviour, causing the standard Poodle to seek recourse to the display of aggression. In this sense, the Airedale is not ‘behaving fairly’ by not cooperating with the others and breaking the rules of the game. Animals have expectations when engaging in social encounters, and certain norms are expected to be abided by as the outright violation of these norms signifies unfair treatment and the lack of social etiquette. Thus, it is interesting to study the evolution of animal morality and to extrapolate from social play behaviour. Bekoff, M., 2001. Social play behaviour: cooperation, fairness, trust and the evolution of morality. Journal of Consciousness Studies, vol. 8 no. 2: 81-90. “Canine Social Behaviour” by Wallascoemom. YouTube Channel, February 23, 2008. URL: http://www.youtube.com/watch?v=Sf5ryLjACLg (accessed 05 April 2010). 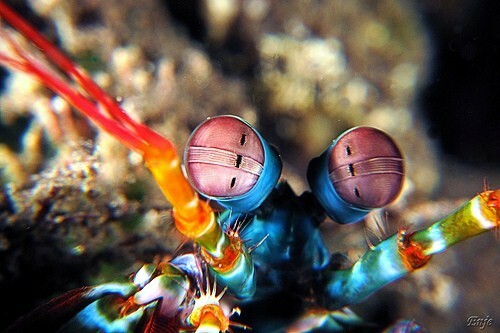 The mantis shrimp is probably one of the most outlandish looking animals on the face of this planet. Looking like an odd mix between a praying mantis and a large terrestrial bug, these predacious creatures feature some of the most highly evolved physical attributes of any invertebrate known to man. These marine crustaceans belong to the order stomatopoda, comprised of around 400 recognised species that are either identified as smashers or spearers according to the shape of their main forelegs and the use of them in obtaining prey. Figure 2 shows the one of the massively muscled main arms of a smashing mantis shrimp. 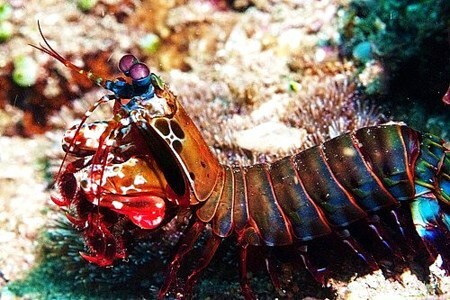 Smashers like the Peacock Mantis Shrimp in Figure 1 drive their club-like elbows into their prey at blinding speeds- up to 2300cm/s in a strike lasting 0.0027ms, the fastest strike of any creature on earth (Patek and Caldwell, 2004). They have earned the nickname ‘thumb splitters’ by divers who have inadvertently gotten to close to these crustaceans, whose blows easily render skin and flesh to the bone. In a bid to understand this process, researchers at the University of California, Berkeley utilised high-speed video cameras with frame rates of 100000 frames/s. Here they discovered the truly devastating nature of smashing mantis shrimp strikes when they observed the phenomena known as cavitation and sonoluminescence occurring during each attack (Patek and Caldwell, 2005). The footage above shows the process of one species of smashing stomatopod, odontodactylus scyllarus, bullying a snail. In layman terms, besides the nasty impact, the strike agitates the water near the point of impact so much that a flash of light, extreme heat and a damaging sonic wave are produced. From the snail’s perspective it is akin to getting hit by a speeding train laden with volatile explosives, that can hit you again and again. And again. As observed in the clip above, mantis shrimp attack with astounding ferocity. Bear in mind that sound of the stomatopod’s strikes are being recorded from outside of the tank, implying some serious impact. Also observed from the video is the surprising agility of all mantis shrimp. Unlike most slow moving crustaceans, stomatopods are aggressive, highly mobile creatures that actively seek out their prey. They routinely leave the seabed and are swift swimmers that easily overpower fish that swim above the seabed. The aggressive behaviour of this intelligent predator and the highly specific physical attributes they display seem to be the result of an evolutionary path taken to ensure survival in an ultimately competitive environment (Caldwell and Hugh, 1975). Club-footed mantis shrimp like the Peacock Mantis Shrimp (odontodactylus scyllarus) shown in the videos above live amongst rocks and coral formations in tropical waters that are teeming with life. Competition within semi-permanent rock burrows is rife, and encounters with various other vertebrates and invertebrates in this crowded habitat have caused an evolutionary ‘arms race’ amongst the reef’s inhabitants (Caldwell and Hugh,1975). Their highly developed mobility, forelegs and compound eyes are the reasons why stomatopods like odontodactylus scyllarus flourish as predators.